Mike Saxton grew up in Vernon, CT. He attended Eastern Connecticut State University starting in 1996. He became a Resident Assistant starting his Sophomore year. The following year, he met and started dating Amy, and the two would be married after graduation. Mike earned a Bachelor of Science degree in Computer Science from Eastern and following graduation, he was hired full time as a Residence Hall Director and subsequently earned his Master of Science degree in Organizational Management. His son, Christopher was born two weeks after completing his comprehensive exams for his Master’s degree. He lives with his wife, son, and two cats Padme and Obi-Wan. His first book, 7 Scorpions: Rebellion is the first of a trilogy (book 2 is Revolution and book 3 is Retribution). Mike was inspired by four years of lucid dreaming that began the summer prior to his Junior year of High School and concluded during the summer after his Sophomore year of college. After spending eleven years compiling the dreams and making sense of them, he gained the sudden inspiration to finally start writing them in novel format. Mike had decided that he wanted to become a writer during his time of lucid dreaming. Life became busy and he shelved the desire for a while but finally got into it. He is hoping to one day be able to write full time. He finds it therapeutic, relaxing, and exciting when he can create whole science fiction and fantasy worlds. He is also pursuing his PhD in Organizational Management. A psychopath, now a dictator known only as Zodiac, has hatched a diabolical plan and in doing so has succeeded in reducing the world into chaos. By secretly planting flash bombs in every major city across the world and simultaneously detonating them, in the blink of an eye, civilization has ceased to exist. In the wake of the destruction, Zodiac unleashed the Seekers (mindless warrior drones with the ability to radiate an aura of intense fear) to complete the enslavement and extermination of humanity. A former vigilante, forced to become a government super-soldier, has emerged to lead a ragtag group of survivors in a fight to the death. Vincent Black, formerly known as Night Viper, has no desire to be a leader. However, someone must lead this unlikely group if any are to survive. In doing so he must also overcome his own demons from his past in order to help preserve the future of humanity. Lovers of Apocalyptic action adventures will quickly be drawn into this story. From the opening pages, the author has left nothing out as the reader is assailed with action, death, and destruction. 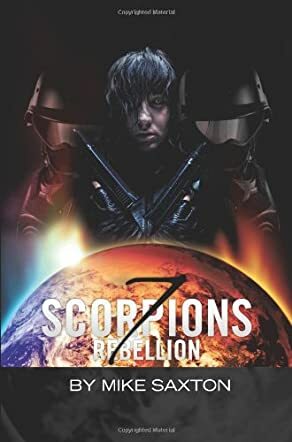 7 Scorpions-Rebellion is a large book filled with memorable characters, particularly those simply wanting a chance to survive against those that are nothing more than pure evil. Overall, the book is well written, and the dialog is very good as well. Unfortunately for me, occasionally the plot would drag in parts, and I would wonder where the author was going. Toward the end it picked up again as the author brought the story to a satisfying conclusion and set the stage for the next installment of the series. I would be interested in seeing what's in store as these improbable heroes fight for their very existence. Very good.